Once you create video clips and graphs, arrange them on the Storyboard to create highlight videos to share with stakeholders. The Storyboard appears at the bottom of the Present tab. The Storyboard is the staging area you use to assemble title clips, video clips, tasks, and graphs to include in a highlight video. You can also enable fade transitions between clips to dissolve smoothly between graphs and clips and fade out at the end of the video. Present allows you to create and manage multiple Storyboards inside one project. Multiple Storyboards are presented in a tabbed view within the Storyboard pane. To navigate from one Storyboard to another, click from one tab to the next. 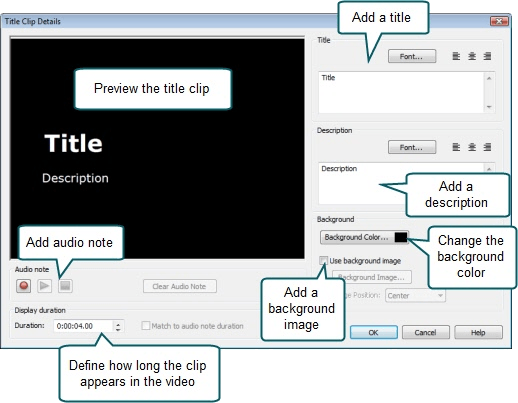 You can add video clips, title clips, tasks and graphs to a Storyboard from the Project pane or the Clip Bin. When you drag a graph or clip to the Storyboard, a copy of the clip is made that is no longer linked to the clip stored in the Clip Bin or the Project pane. If you edit a clip on the Storyboard, the changes will not apply to the original in the Clip Bin or Project pane. Select the task, clip or graph from the Project pane or Clip Bin and drag it onto the Storyboard. A thumbnail image appears on the Storyboard. If you drop files onto a Storyboard tab (on the tab itself), the dropped clips are appended to the end of the Storyboard. If the tab you dropped on was not the currently visible Storyboard, the Storyboard associated with the tab you dropped on is selected and made visible. If you drop the files within a Storyboard (not on the tab), they are added at the point the mouse was when they were dropped. 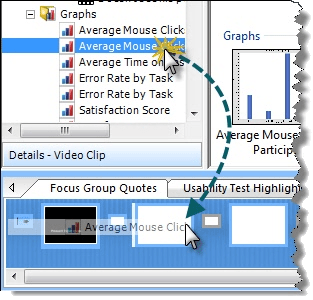 To insert a Clip, Graph or Task before Another Clip, drop the clip, graph or task on top of the one you want to follow the current clip. Transitions are animated effects that allow you to move smoothly between graphs and clips as well as provide a more professional-looking intro and outro. If you do not enable a transition between clips, the first clip cuts abruptly to the next. You can enable a transition before the first clip on the Storyboard and after the last clip. The default transition is a 3 second fade from black. You can select from a variety of transitions as well as change the default transition type and duration. The last transition placeholder automatically adjusts its position as you add graphs and clips to the Storyboard, so it always remains to the right of the last clip. To change the type of transition (for example use spiral instead of fade) right-click the transition placeholder and select Choose Transition Type. To change the duration of a transition right-click the transition placeholder and select Edit Transition Properties. The duration can be up to 30 seconds. By default, transitions fade from black and last three seconds. You can change the default by clicking Edit > Transitions > Default Transition. Note that you must be in Morae Manager in the Present tab for this option to be available. Changing the default transition will not change transitions already in place on your Storyboard. The default transition only applies to subsequent transitions. To quickly enable all transitions, including fade in, fade out and all transitions between clips, right-click on any transition placeholder and choose Enable All Transitions. To disable all transitions at once, right-click on any transition placeholder button and choose Disable All Transitions. Title clips can introduce a video or act as static transitions between video clips and graphs. You can customize the color, text and duration of the title clips and add audio narration and a background image. Title clips are global, which means they are used throughout the project, not specific to a given recording. To create a title clip, click the Create Title Clip button or choose Create > Title Clip. The Title Clip Details dialog box appears. Click the Produce and Share Highlight Video button or choose File > Produce and Share > Highlight Video. The Production Wizard appears and leads you through the production process. Select your preference from the Production Type options. Click Next. Select one or more Storyboards to produce as WMV, MP4, or AVI videos. Click Next to continue. The Video Encoding Options dialog box appears. WMV — Provides a good compromise between file size and video quality. Use for recordings that contain a lot of motion, such as camera video-based or screen videos with animation. MP4 — Provides a web-friendly format, often viewable on Windows, Mac, and some mobile devices. AVI — Provides the highest quality video, but may increase the size of your recording file, especially if the video contains areas with a lot of motion, such as Picture in Picture (PIP). Set the size of the produced highlight video. For screen video, we recommend using the default setting, which is the largest video size. This will give you the best resolution and clearest video. If your screen recordings are of more than one monitor, you will need to scale the video to a smaller size. Videos with large resolutions will not play in some media players. Click Next to continue. The Product Video dialog box appears. Set the destination folder, file options, and whether you want an opportunity to view the video(s) after rendering. Click Finish. The rendering begins immediately.